NEW YORK, NY--It was the Metropolitan Opera's Opening Night Gala but you didn't have to stroll down the red carpet to enjoy the company's new production of "Lucia di Lammermoor." 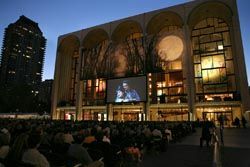 For the second consecutive year, Scharff Weisberg provided a giant screen with projection equipment at Lincoln Center's Josie Robertson Plaza for a live simulcast attended by an estimated audience of 3,000. The Panasonic, Budweiser, and Toys R Us screens at Times Square also beamed the live event to thousands more. As with last year, the company employed a Gerriets International Gray Screen on a 36 x 20-foot frame superbly built by the Met's scenic department. Scharff Weisberg specified, installed and aligned two Christie Roadie 25K projectors, which were chosen for their bountiful 25,000 lumen light output and native 2k resolution. Scharff Weisberg and Video Applications, firms with extensive histories in the presentation and staging markets, recently announced a co-ownership agreement. While continuing to operate independently the two companies work together strategically to provide clients with state of the art audio, video and lighting equipment and services.